I like giving my projects names - in this case, it's the "Clarissa dress" because I made it to portray Clarissa Moody Wright (1804-1871) in Canton's Dairy Festival Parade. It was difficult to figure out exactly what date to aim for: Clarissa was ten years younger than her husband, but the man who was going to portray Silas* is ... well, there's a larger age difference; I also look young for my age by modern standards and very young by early nineteenth century standards. So should I dress as Clarissa would have as a long-married woman, or as the age that I look? In the end, I decided that a) it's not much of an educational event, as I won't be doing any actual interpreting, b) nobody in the crowd bar three or four people is going to have any idea that I'm representing a real person, let alone who she is and when she was alive, and c) I really wanted to sew the green checked dress from the mid-1820s from Regency Women's Dress. That seems fair to me. * We're not quite up to the event yet, but he's found that he can't do it due to a lack of appropriate clothing, so that point is moot now! Making this dress also gives me the opportunity of explaining a few things. Not everything in Regency Women's Dress was as well-explained or as thoroughly illustrated as I would have liked, and I've been meaning to write up some kind of errata page for this blog - this is a good place to start, since this is the most complicated of all the garments in the book. Because - as you can see - there's a picture of this dress on a mannequin, I should probably address one of the most frequent topics of conversation that's come up about RWD. 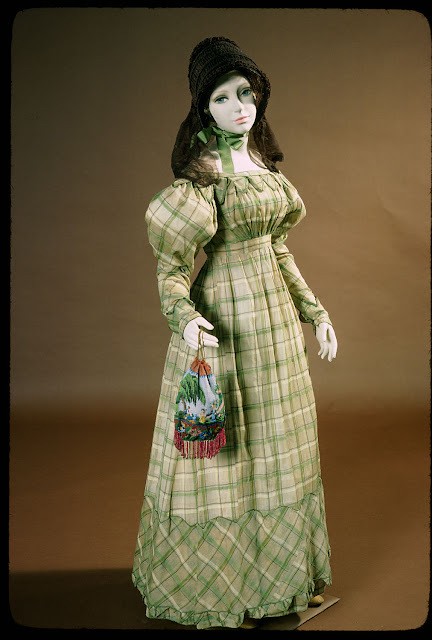 There are only four garments in the book that had already been photographed by the museums that owned them: this one on p.98, the red bib-front dress on p.46 (both from Old Sturbridge Village, photos from some time ago), the ball dress on p.94 (from Historic Cherry Hill, although it was photographed long ago and might have only been available in black and white) and the gold evening dress on p. 78 (from the Albany Institute of History & Art). There was no question of dressing the others and photographing them: most museums, especially the small ones, do not have a studio space set up to take pictures of items this large, or the space to set up a temporary paper roll, lighting, etc. (which they don't own, so I would have had to buy my own), or even appropriate mannequins or dress forms in the first place. Even laying them out on a sizable table covered with white cloth under good lighting was not a possibility, in some cases because the lighting was very bad or the table was small or the sheet was hideous, and in all cases because I didn't have a scaffold to use to take pictures from above and lights to angle in to prevent my shadow from falling on them. After having done RWD, I understand why the pattern books being done now are in-house, like Costume Close-Up and Seventeenth-Century Women's Dress Patterns, because you really need all the resources of a big institution, entire workdays, and a measure of control in order to do it right. I regret to say that there are a few straight-up mistakes in the pattern. The bodice side seam - and it boggles me how I managed to do this - is depicted as much longer on one piece than the other. There was a certain amount of easing, but not that much. I increased the shorter piece to about 5". The cuffs are basically rectangles, with a slight curve on the ends. Due to the 1/8 scale in my sketches this curve got exaggerated in my drawing and then exaggerated again in redrawing for publication into quite a steep curve/point. I also somehow neglected to pattern the larger triangles that go over the shoulders. For this project, I just added another inch in length to the ones that are patterned. There's a lot of room for an individual seamstress to vary the order of operations with this dress, so I'll explain my own and if you like, you can follow it. 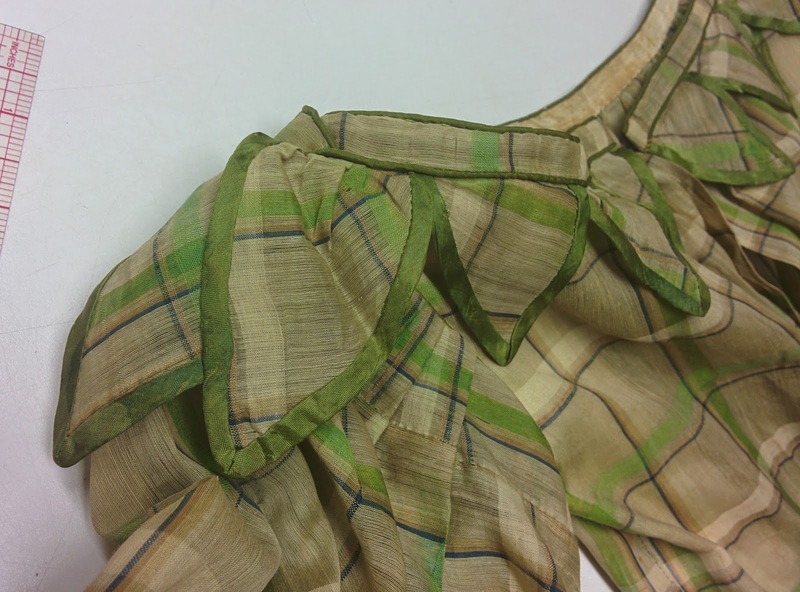 While the original was a very sheer cross-barred/checked silk, I used a semi-sheer madras cotton check. It's not a perfect substitution, but the fabric was a good price and it's still got a very light hand, so I don't think it's inappropriate to combine with a lightweight silk for piping/binding. The first thing I did was cut out the bodice and sew the side seams. A running stitch sufficed, since this would be reinforced later. Yes, I did sew this entirely by hand! I bound these with a blind/slip stitch (visible as a running stitch on the back), and my stitches were a bit too long, but there's no stress on them at all, so it's not worth too much bother, especially if you have a deadline. As you can see, I did all the pinning first and then went through and sewed them all - it's faster to do one thing for a while and then the other, rather than switching back and forth. 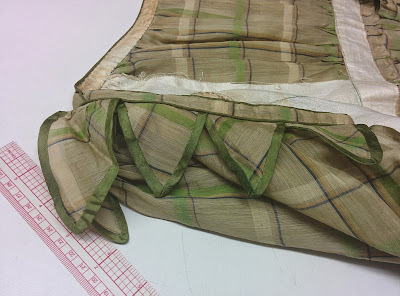 On this gown, the bodice is gathered in front and back and sewn to a separate, piped neckband, which is itself made of separate front and back pieces. While I scaled the bodice and skirt up proportionally (probably too much, to be honest - I thought it would be simpler to make this as it's all gathered, but for the same reason it was a lot less straightforward than dealing with a fitted bodice), I left the neckline the same dimensions as the original, reasoning that I have somewhat narrow shoulders and so this shouldn't need to change. At this point in time, I think I should have made the bands just a little longer ... but I haven't 100% finished this gown yet, so we'll see. The piping is Sugar'n'Cream - I'd prefer something a little smaller, like kitchen twine, but my twine has disappeared and with my slow sewing pace, I needed to get working. As you can see, I piped the top edge of each piece (again with straight-grain bands), overlapped them at the shoulder, and then basted a row of piping over the whole thing. I followed that by basting the triangles on, pleating the larger ones a little. Basically, this is going to involve sewing a lot of layers together, and you want to make sure not to lose the definition of the piping or have things slipping around, so basting is your friend. Around this time, I tested how large the armscye would be by pinning the bodice to the band and realized that it was way too small, so I pieced in a bit to the top of the bodice to give it a steeper curve from the center front and back up to the shoulders. After that, I cut out the side lining pieces that really just strengthen the armscyes, and backstitched the bodice to them down the side seams. It was fairly simple to run gathering stitches in the top edges of the bodice pieces - excluding the side linings - gather them to the required lengths (remember, the neckline is the same size as the original pattern, so the bodice needed to be gathered to the same measurements as the original, rather than a proportional amount), and backstitch all of these layers together. This is where hand-sewing is very preferable, I think. You need to feel the piping that's sandwiched between all these layers, and I can't imagine I could have done this on the machine without ending up needing to unpick and resew parts of it. That said, I'm an extraordinarily sloppy machine-sewer. You can probably tell by the square, edited photos that I'm hotlinking from Instagram! Feel free to follow me at mimicofmodes. I post progress pics, as well as views around Canton when the weather's good and detail shots of garments I'm accessioning, reboxing, etc. at work. I absolutely love that plaid dress you're recreating! I'm using one of the patterns in there, and it's going along well. All but one of the seams matched up really well (one side of the sleeve seam was about two inches longer than the other), which I appreciate. Ha! I also forgot to mention that I sometimes name my dresses, but they aren't anywhere near as elegant as "Clarissa". It's being named the "Monkey Arm dress", because the overly-long arms on a mannequin just don't look right. And you're helping me help future readers know about that!